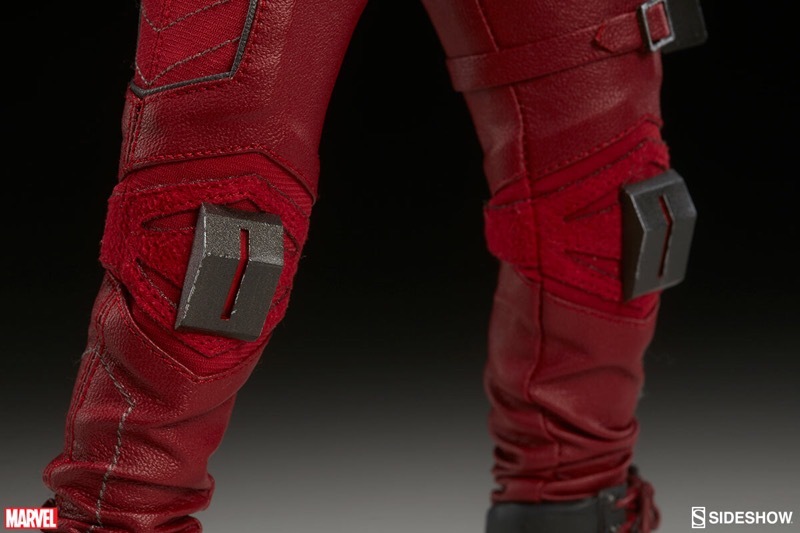 Sideshow is proud to present our interpretation of one of our most beloved Marvel Comics characters. The Devil of Hell’s Kitchen, the man without fear – Daredevil! 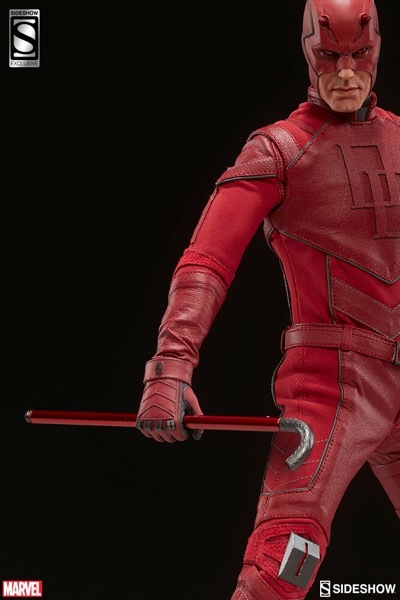 Blinded by a mysterious radioactive substance, Matt Murdock discovered that his remaining senses were heightened to an extraordinary degree. His newfound “radar sense” made it possible for him to sense the objects around him, hear a heartbeat, read printed material by running his fingers over the ink on a page, and even feel microscopic changes in air pressure to dodge incoming attacks! 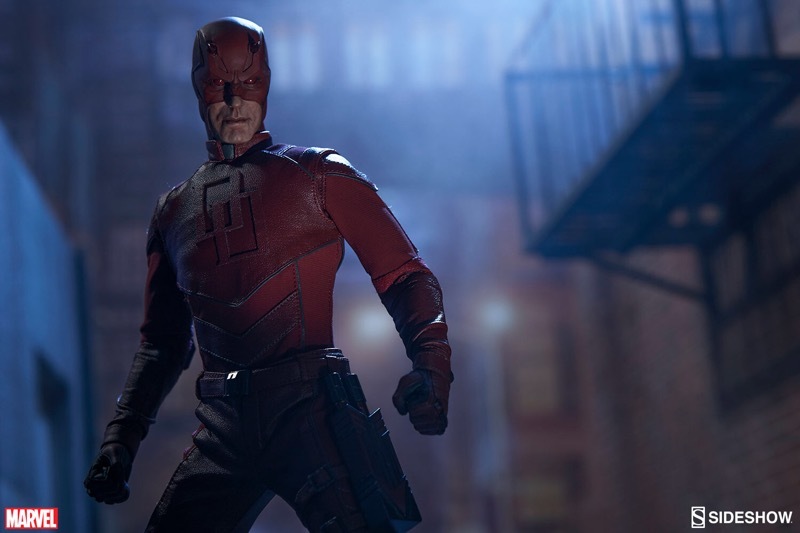 Tirelessly honing his physical and mental skills, Murdock becomes an inner-city lawyer by day and a fearless vigilante by night, tackling injustice on both sides of the law! 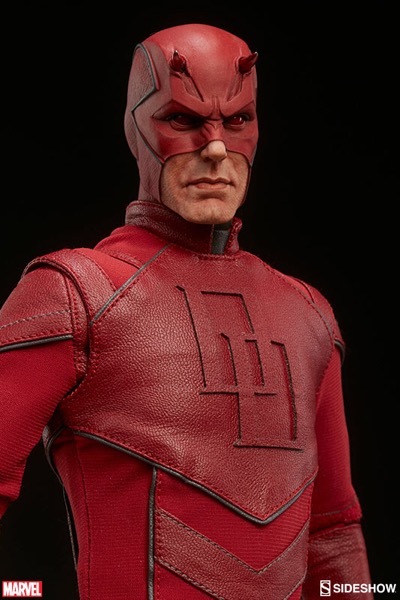 Daredevil is a much-loved character here at Sideshow HQ, and bringing our interpretation of this popular crime-fighter to life was a true passion project for our artistic team. 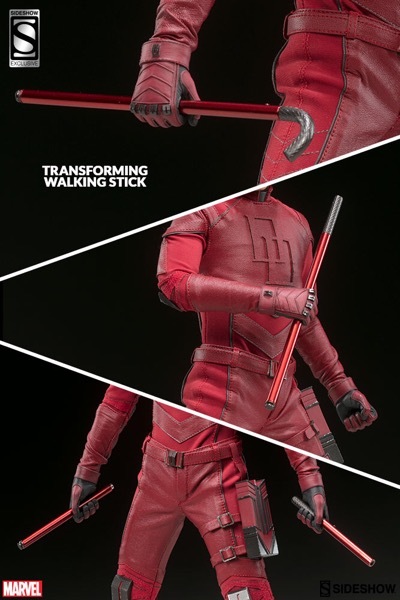 Our new Sixth Scale Figure combines several of his most iconic “looks” to create an original design that pays homage to the character we know and love from the comic books. 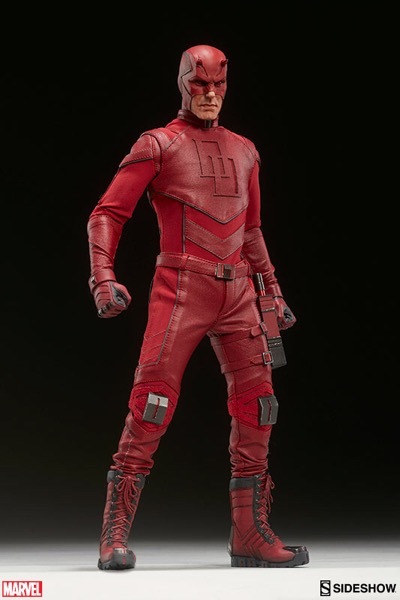 This all-new Daredevil suit has been painstakingly designed and expertly tailored to feature many subtle “Easter eggs” and symbolic clues that give visual nods to Matt Murdock’s background, beliefs, and ideals. 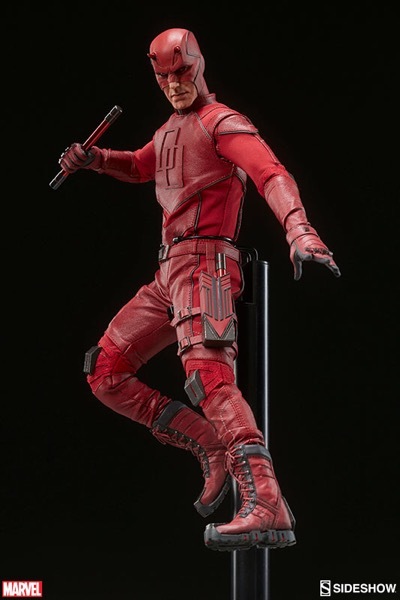 With numerous points of articulation and four sets of sculpted hands, this figure offers a multitude of options for posing and display. 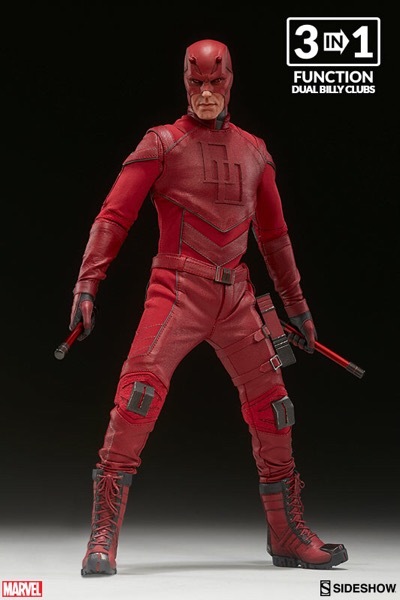 A must-have piece for any Marvel collector, he also makes an ideal companion for our Punisher Sixth Scale figure. 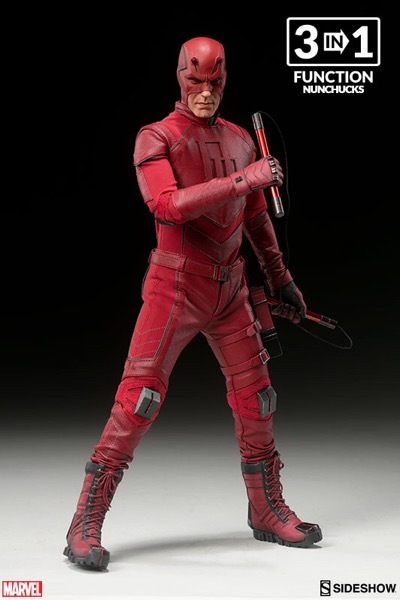 The Sideshow Exclusive variant for this sixth scale figure includes a cane (used by Matt Murdock as part of his lawyer persona) that can be modified to become part of his arsenal of combative tools. Der Kopf wirkt meiner Meinung nach viel zu groß für den "schmächtigen Körper"!!! Irgendwie kriegen die das mit "dem Größenverhältnis" Kopf zum Körper nicht so wirklich hin, oder sehe ich das falsch...??! 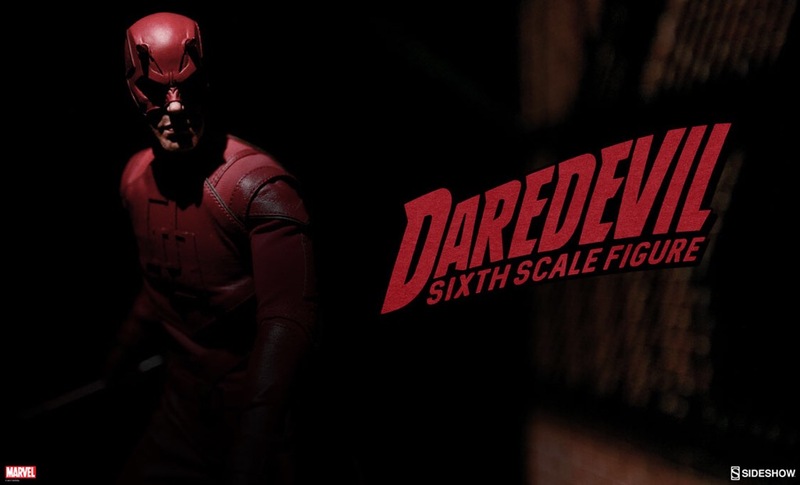 We’re expanding out Marvel Sixth Scale Figure line to include a man without fear! 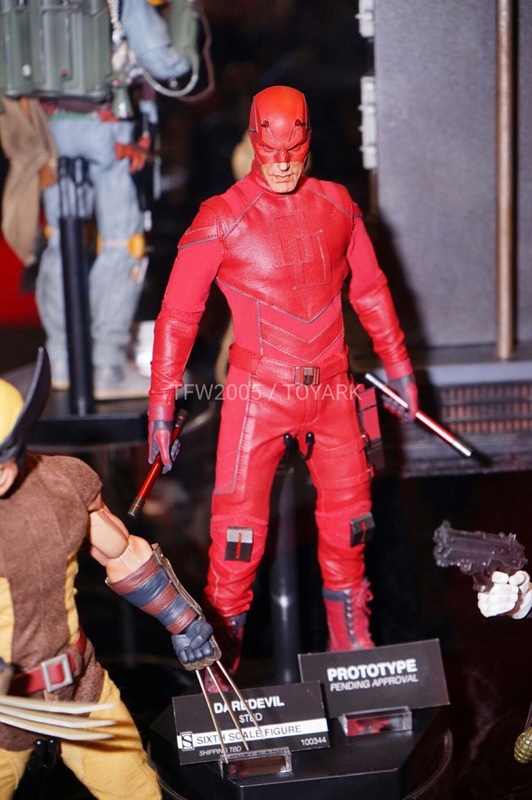 The Daredevil Sixth Scale Figure will be available for Pre-Order on Thursday, February 16, 2017! 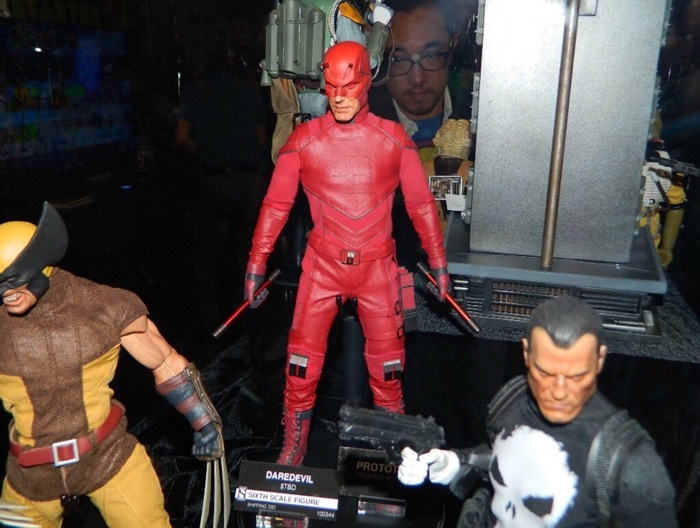 Also, remember to pick-up our other sixth scale Marvel figures The Punisher, and Deadpool! 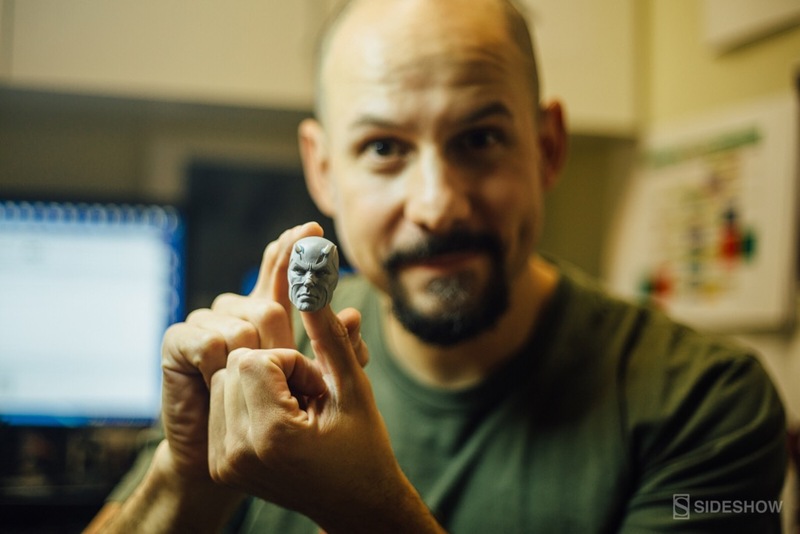 Sideshow is proud to present our interpretation of one of our most beloved Marvel Comics characters. 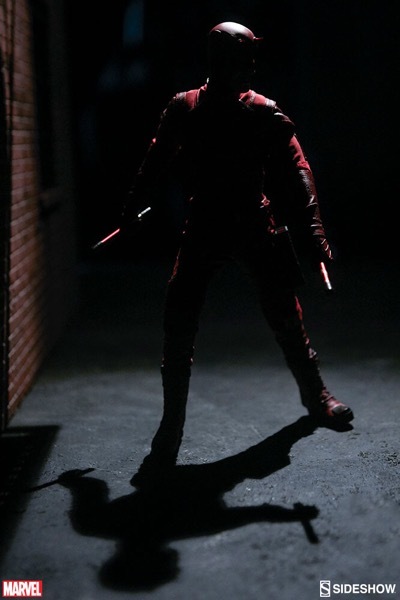 The Devil of Hell’s Kitchen – Daredevil! 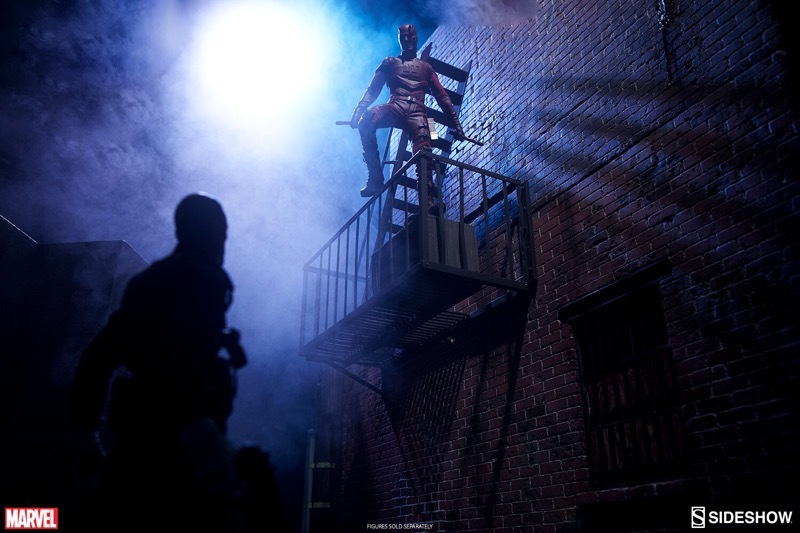 Blinded by a mysterious radioactive substance, Matt Murdock discovered that his remaining senses were heightened to superhuman levels. His superior hearing and sensitivity of touch gave him a newfound “radar sense”- not only making it possible for him to sense the objects around him, but also to hear a heartbeat, read printed material by running his fingers over the ink on a page, even feel microscopic changes in air pressure and dodge incoming attacks! 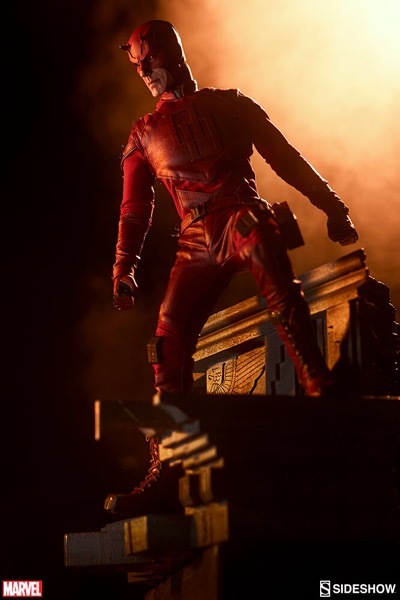 When his Father – the boxer known as Battlin’ Jack Murdock – is murdered for refusing to throw a fight, Matt uses his new abilities to seek revenge on his killers. 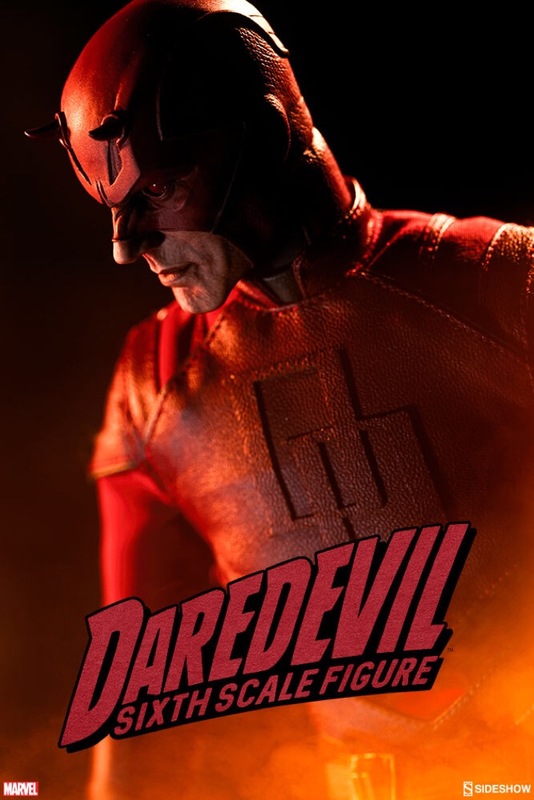 Training in multiple martial arts with the same dedication that he used to pursue his academic endeavors, tirelessly honing his physical and mental skills, Matt Murdock becomes an inner-city lawyer by day and a fearless vigilante by night – fighting injustice on both sides of the law! 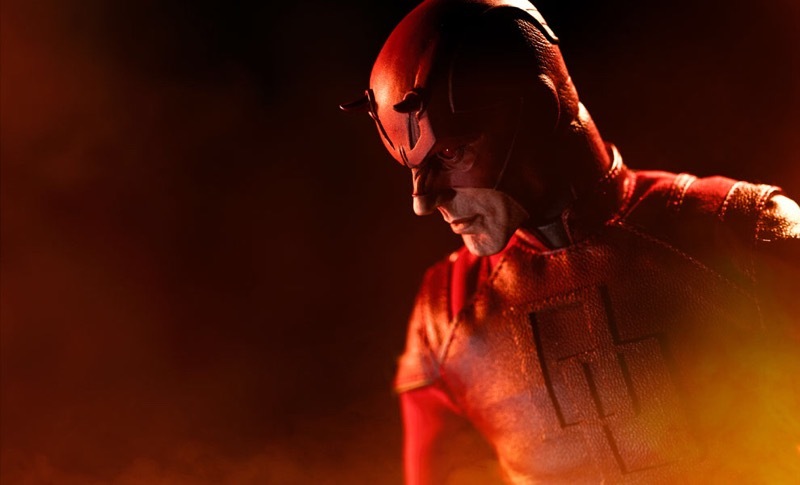 Daredevil, as he tackled with his own moral ambiguities and emotional demons, became much more than a superhero for many Marvel fans. 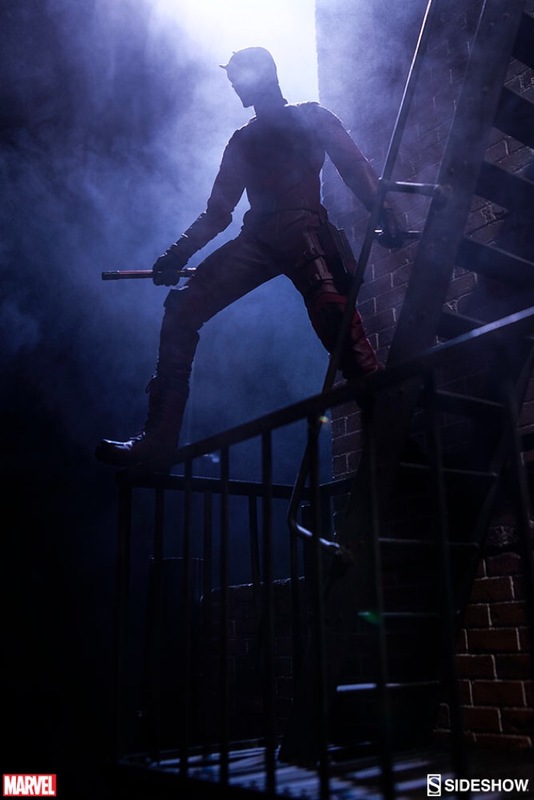 His thrilling nighttime crime-fighting and death-defying acrobatics were always tempered by an alter ego who strove to resolve a city’s problems within the limits of the law. 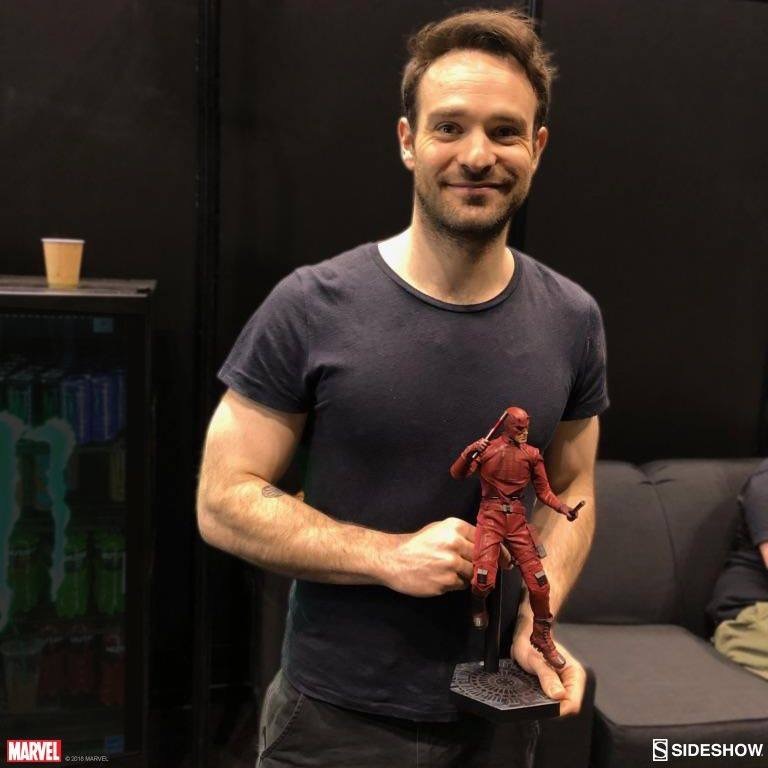 The two sides of Matt Murdock gave fans a believable and sympathetic character who they genuinely rooted for. 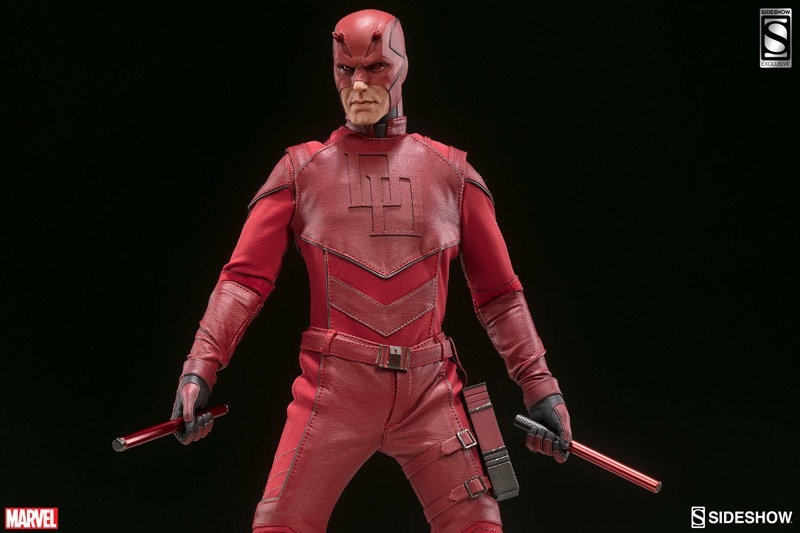 Daredevil is a much-loved character here at Sideshow HQ, and bringing our interpretation of this popular crime-fighter to life was a labor of love for our artistic team. 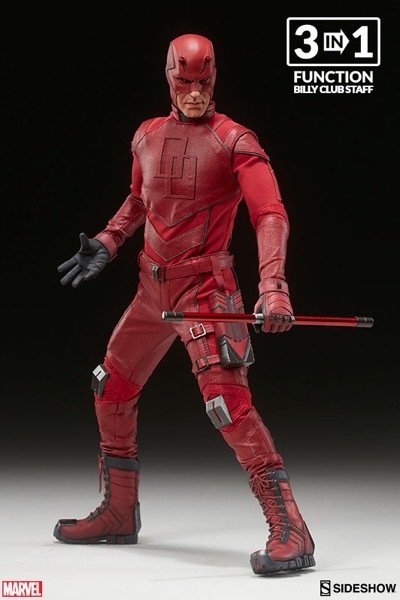 Matt Murdock has appeared in numerous guises over the years, and our new Sixth Scale Figure combines several of his most iconic “looks”. 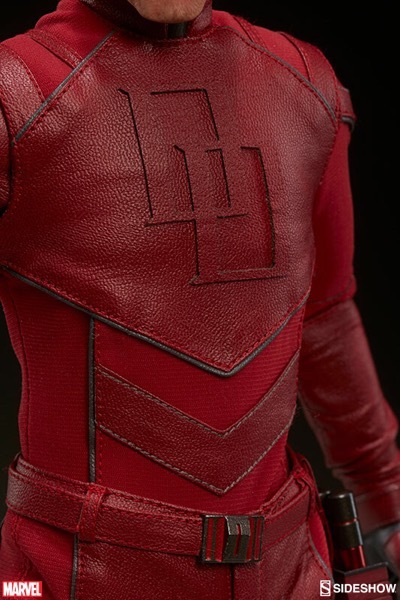 We took inspiration from the classic comic-book Daredevil, dressed head to toe in red with his horned cowl and twin “D” logo on his chest, and then added design motifs from his relatively short-lived Armored suit from the 90’s – while always being mindful not to break up his streamlined silhouette. 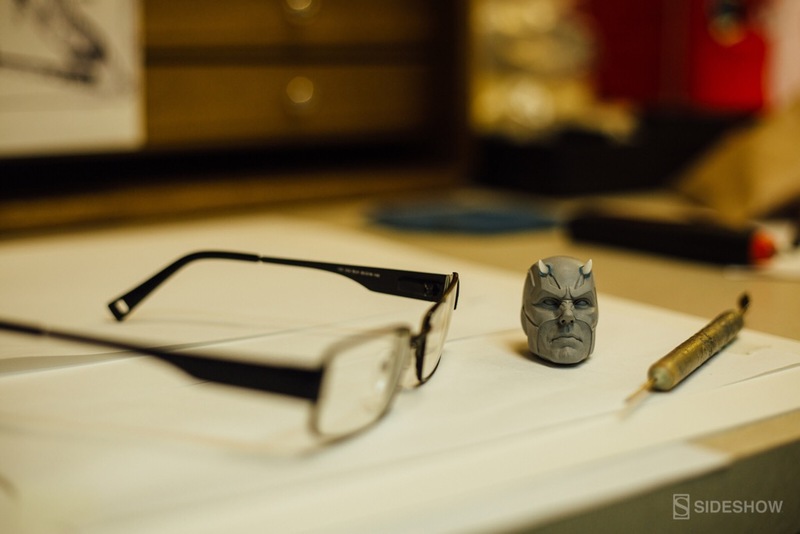 The aim from the outset was to create an original design that pays homage to the Daredevil we know and love from the comic books, while bringing a new twist to a classic character. 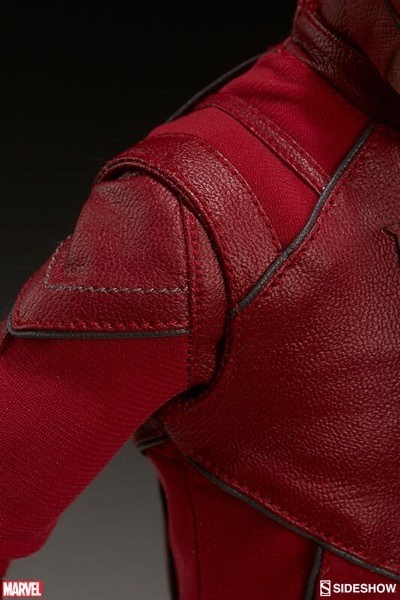 This quickly became a passion project for our team, and we took every opportunity to add additional “Easter eggs” and symbolism to the design of his tailored fabric and leather-effect costume. 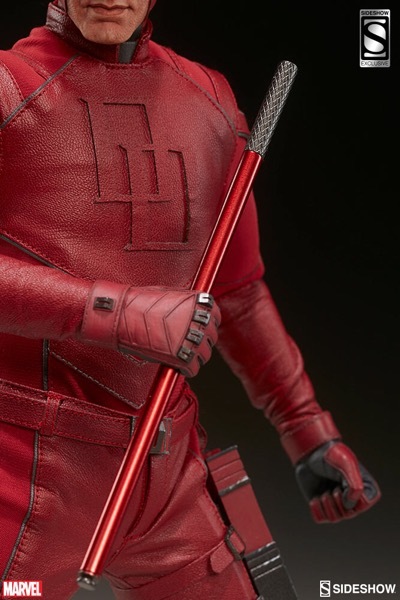 “Since Matt Murdock’s faith is very much at the heart of who he is, we wanted to try to incorporate some elements of his religion into the suit in very subtle ways. 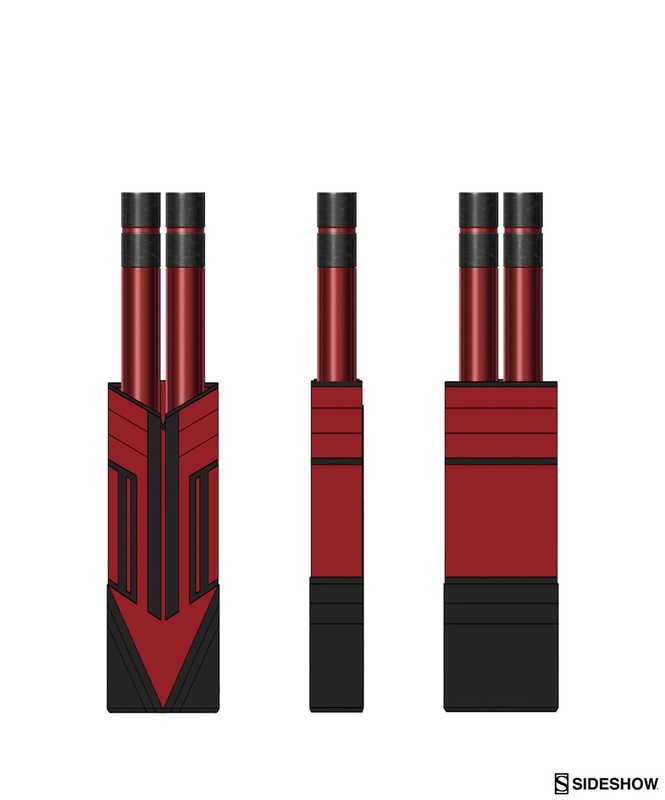 For example, the collar of his suit has a square cut-out in the center to give the impression of an inverted priest’s collar”. 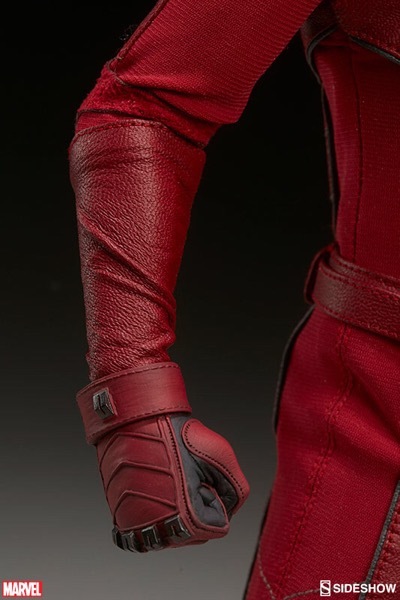 “Inspired by the kneepads of the 90’s armored suit, we created metallic block-shaped design elements with an implied cross-shape that we then repeated throughout the suit. 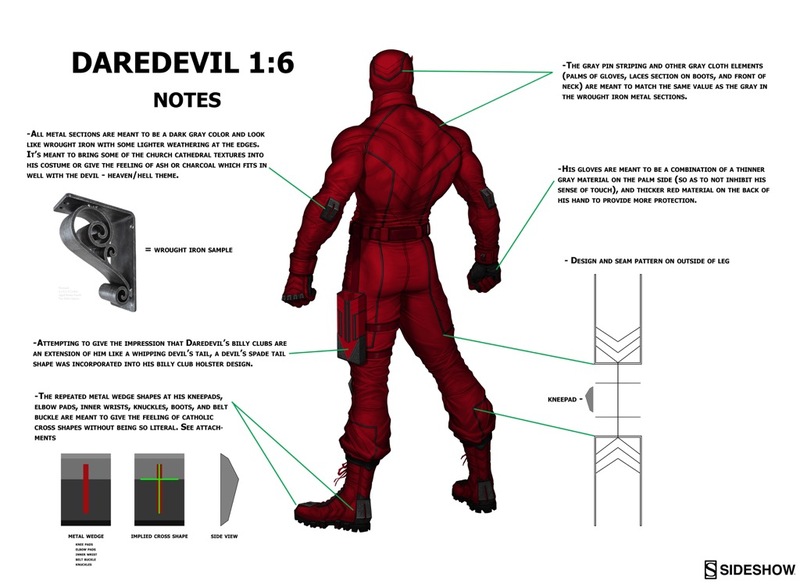 The idea being that we permanently incorporate some of the wrought iron elements of church cathedrals – that we generally associate with Daredevil’s environment – directly into his suit design”. 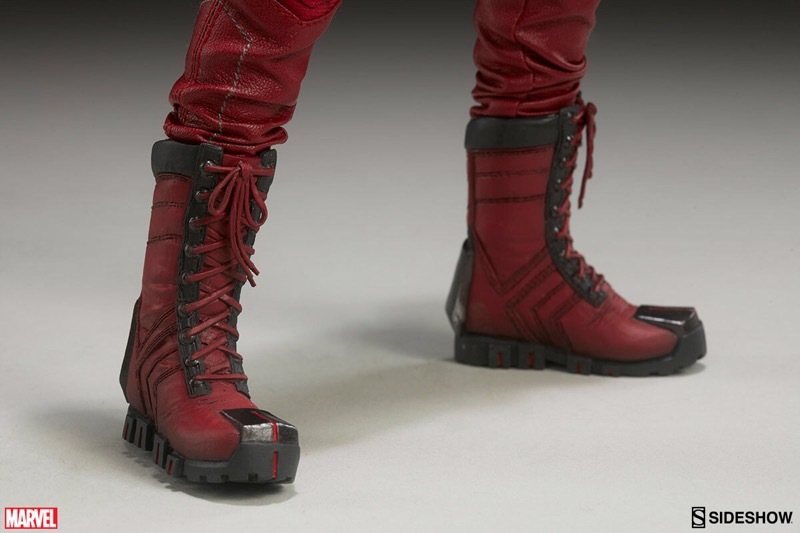 “Beneath his feet, another cross shape is formed by the negative space in the tread of his boots”. 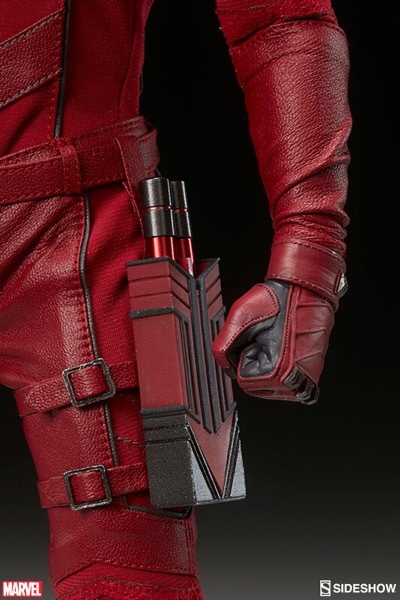 “There’s also a spade ‘devil tail’ incorporated into the design of his billy club holster that helps further the heaven/hell dynamic”. 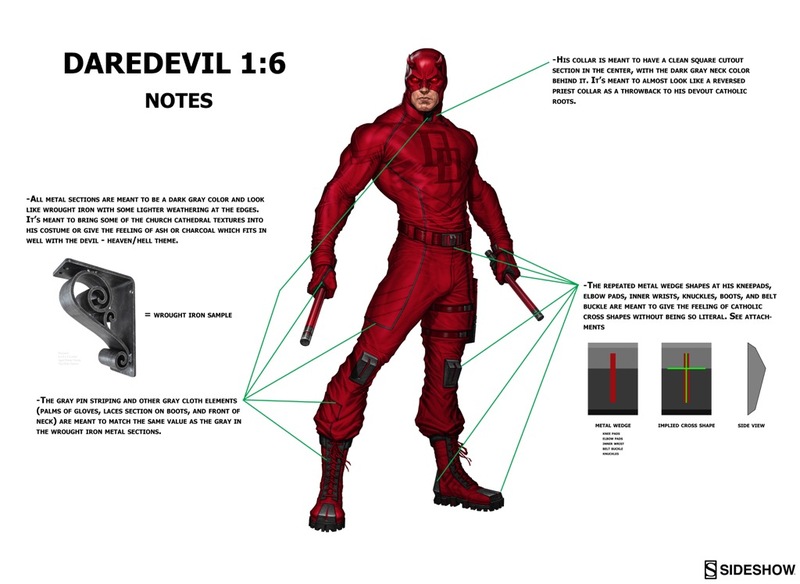 The design of Daredevil’s signature weaponry was a fun and unusual challenge. 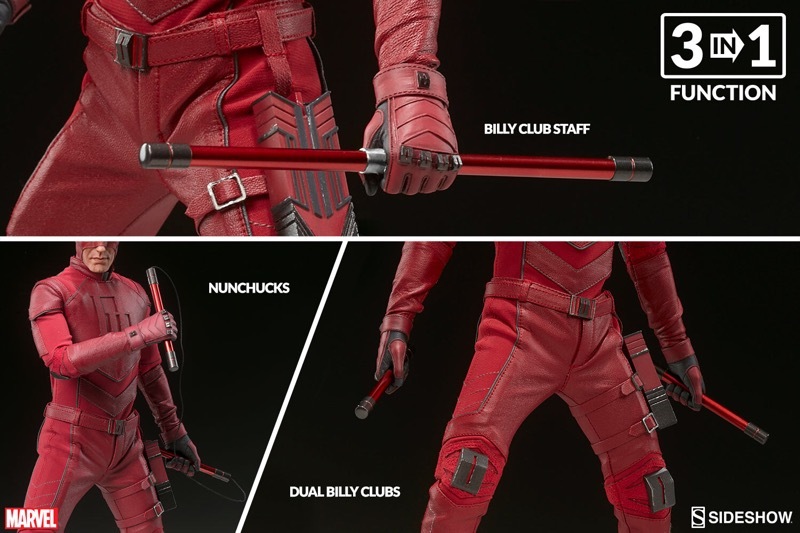 As a martial arts master, Daredevil equipped himself with two multi-purpose billy clubs that could be wielded like Eskrima sticks, joined together to make a staff, attached to a cable to make nunchaku, a flail or even a grappling hook. 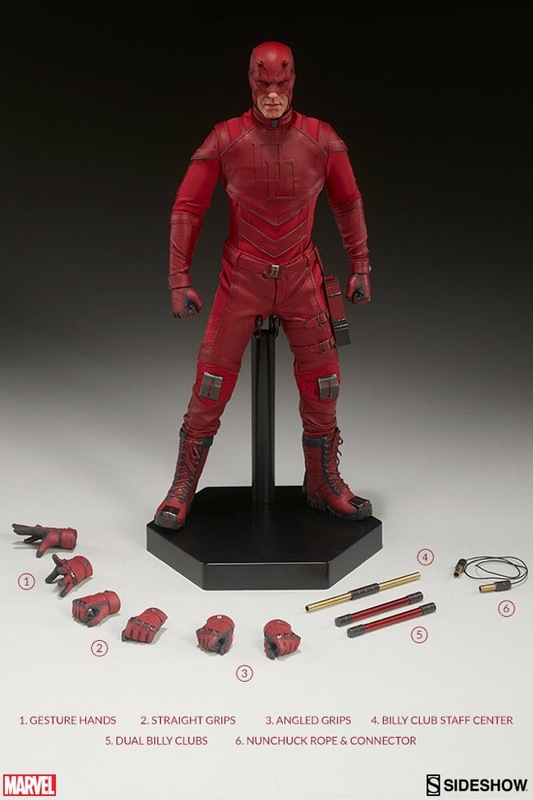 With numerous points of articulation and four sets of sculpted hands, this figure offers a multitude of options for posing and display. 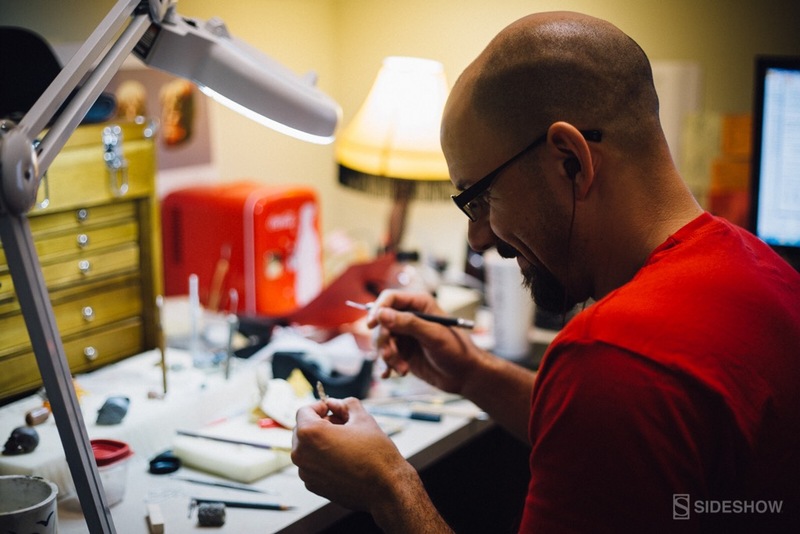 He also makes an ideal companion piece for our Punisher Sixth Scale figure. 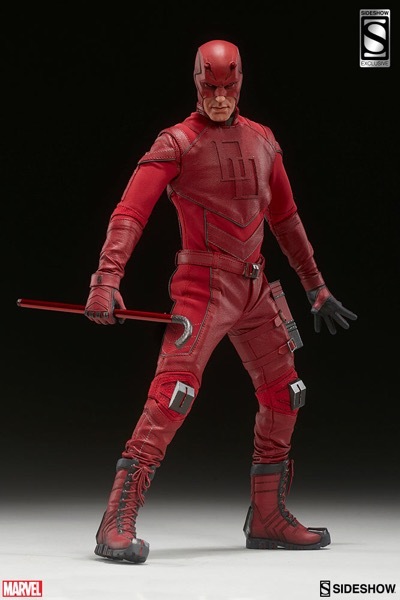 Sideshow’s all-new Sixth Scale interpretation of Daredevil will be priced at 229.99 and available for pre-order on Thursday, February 16. Eröffnungspost mit allen Bildern & Daten. Die Figuren sind ambitioniert und sicher nicht schlecht in der Qualität. 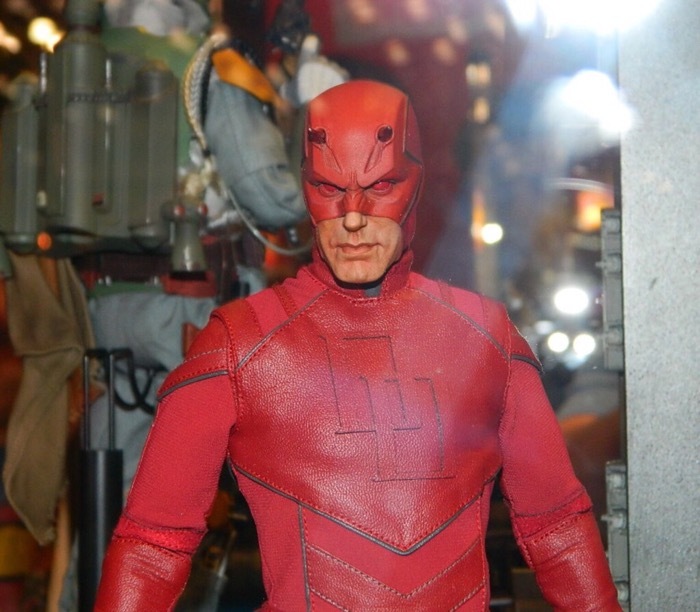 Ich kann denen aber absolut nichts abgewinnen und finde, der Daredevil ist der erste der Reihe, der halbwegs gelungen aussieht. 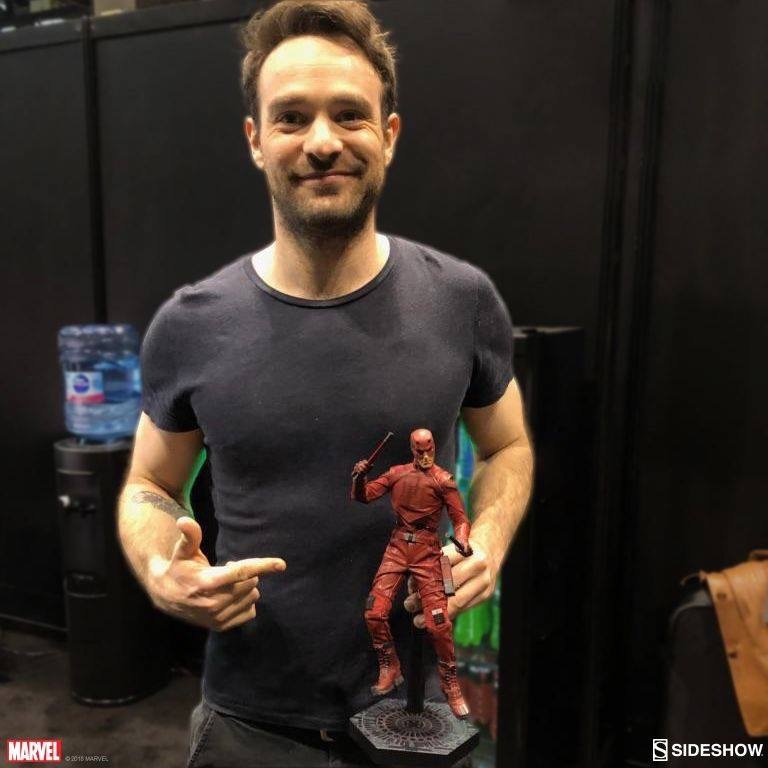 With our Daredevil Sixth Scale figure, it's Daredevil himself -- Charlie Cox!